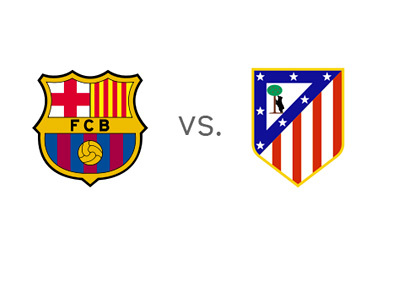 Barcelona FC host Atletico Madrid in a decisive, last round, match in the Spanish La Liga on Saturday, May 17th, 2014 at Camp Nou. If Barcelona win, they will win the title for the second time in a row, and for the fourth time in the last five seasons. If Atletico win, or if there is a draw, Atletico will be lifting the league trophy for the first time since 1995/96. The two teams have met five times already this season. In the Spanish Super Cup, the score at Vicente Calderon was 1-1, while the score at Camp Nou was 0-0. Barca won the cup on away goals. In the league, the score in Madrid was a 0-0 draw. The two teams met again in the UEFA Champions League quarter-finals, where Atletico won 2-1 on aggregate, after a 1-1 draw at Camp Nou. The big question for Lionel Messi & Co. is if can they finally beat Atletico this season in their sixth attempt. On the other hand, Atletico have had an outstanding season so far, but will they have enough juice left to cross the finish line as winners? According to the odds, Barcelona are the favourites to win the match and the slight favourites to win the league. Barcelona have not played well in their last seven games and it is almost incredible that they still have a chance of winning the title. On Saturday they will be without Neymar due to injury, but the team could receive a boost from the likely return of Gerard Pique to the lineup. With the UEFA Champions League final coming up on May 24th, the ten days that follow are possibly the most important ten days in Atletico Madrid's history. Will Diego Costa and his teammates be able to successfully cope with pressure? They are two games away from making history. Enjoy the game everyone, it could be a good one!